The veritable Egg Tart, a Chinese bakery staple as well as many a Dim Sum service. There are the good, the bad and unfortunately the ugly. Personally, I love the ones with the flaky puff pastry over the hard tart shells (like the ones from Anna's, bleck!). However, I do realize it is very subjective, so each to their own. 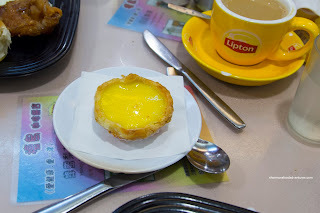 So while in Hong Kong, the logical thing to do is eat lots of food and for at least this morning - to see if the famed Egg Tarts at Honolulu Coffee Shop live up to their name. 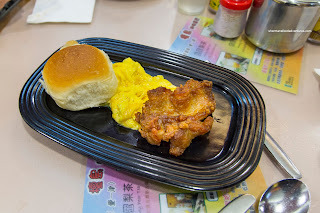 We traveled the short distance from North Point to Wan Chai on the MTR for some breaky, so I decided on the Scrambled Eggs and Chicken Steak accompanied by a buttered roll. I gotta say the eggs were pretty good being silky and runny. 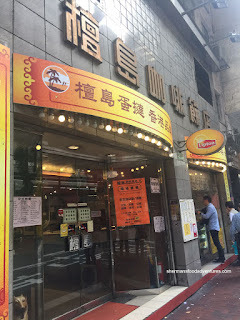 However, that chicken steak... There was enough oil in and around that thing to heat a house. Furthermore, it was so overdone, the meat was akin to jerky. Not good at all. Viv had the Eggs and Pork Chop and sadly, it was equally oil-logged. She resorted in using napkins to soak up the grease. Texturally, it was not as chewy as the chicken though, so that was a plus. For my son, he had over easy eggs and buttered roll with Ham and Spaghetti in Soup. 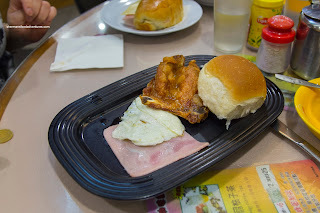 So nothing particularly interesting with the roll, but the eggs were nicely runny and yes, greasy. 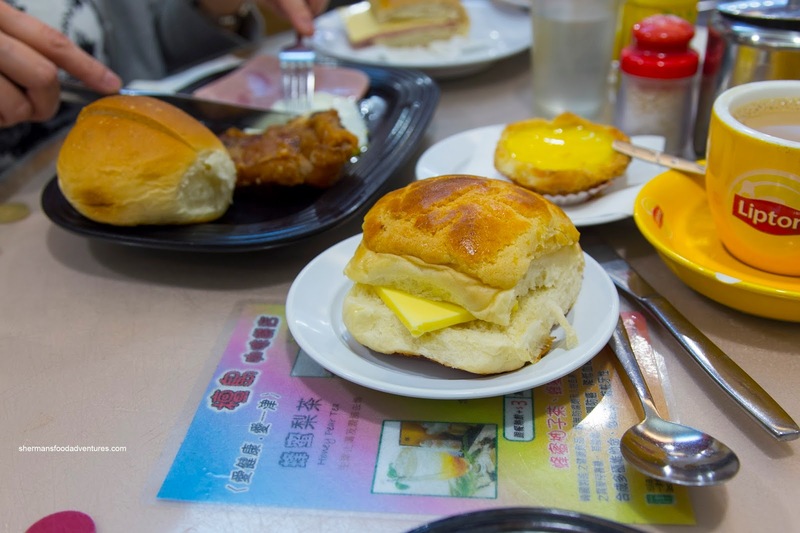 The runny yolk was good with the lightly buttered roll. 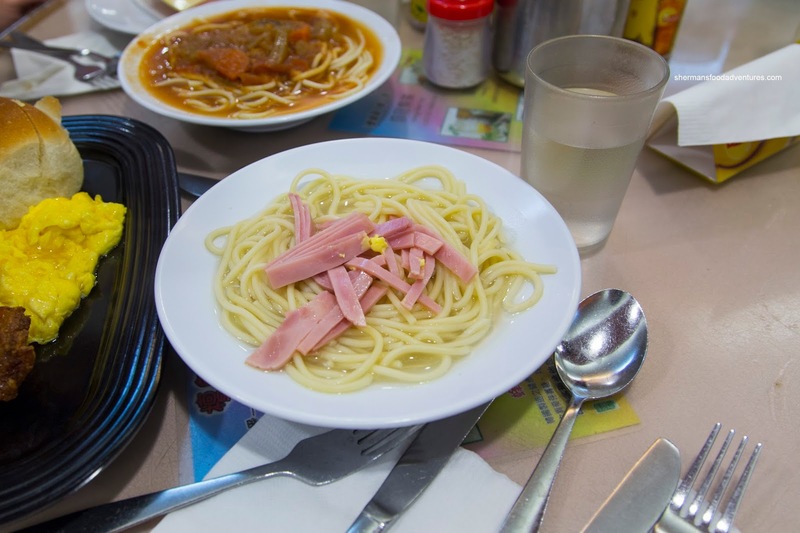 As for the spaghetti, it was actually somewhat al dente rather than the usual overdone pasta. The soup was fairly mild while the amount of ham was adequate. 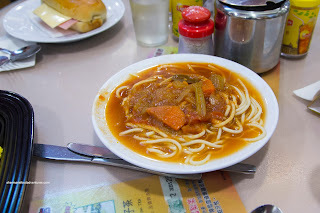 My daughter went for something different in the Spaghetti with Borscht. Again, the spaghetti was firm and the borscht was the typical tart Hong Kong-style cafe version with some cabbage, tomatoes and onions.